Pumpkin pie. They say you either love it or hate it. When I was a kid, I remember distinctly not liking it. But as I’ve gotten old, and the US has grown further away as I implant myself more and more in France, I look forward to my annual pumpkin pie. Weird. Yesterday I baked 4 dozen mini pumpkin-cornmeal muffins (a mash up of the Joy of Cooking's pumpkin bread and Brooke Dojny's Shaker Corn Pumpkin bread) to bring to school and the crèche so my kids have some sense that it’s a special day. And Happy Thanksgiving to all the Franco-Americans especially Max and Suzanne. Enjoy that pumpkin pie. BTW, unfortunately God did have something to do with the first Thanksgiving as the Pilgrims were Bible reading peole. They most likely were inspired by the Biblical holiday of Sukkot, a day of thanksgiving and gathering in the crops. yeah yeah, but try telling that to a bunch of 5 year olds while translating a book from English to French. As an American living in Ireland and about to move to France, I am thankful for your blog. Happy Thanksgiving! thanks puppyfur! good luck with your move to France! 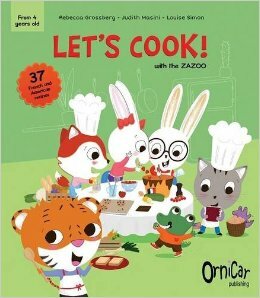 Let's cook with the Zazoo! French-American living in Lille,raising a Franco-American family, cooking and fighting against excessive dog excrement. Multilingual Living - Because global communication begins at home!